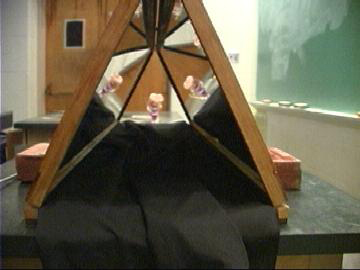 Description: This demo uses three large mirrors which serve to model a kaleidoscope. Place the video camera at one end, and the action figure at the other. Connect the camera to the AV equipment. 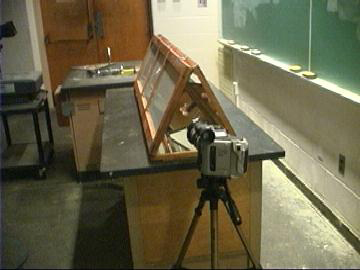 Set the projector the the camera feed. 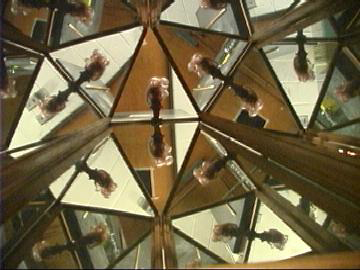 Note what it looks like to look through a kaleidoscope with only two mirros showing. Take out the black cloth and show what it looks like with all three mirros showing.